FUJIFILM Corporation has successfully developed intestinal epithelial cells derived from human iPS cells for optimal use in assessing drug absorption in joint research conducted with Nagoya City University (Graduate School of Pharmaceutical Sciences, Professor Tamihide Matsunaga). The cells have been confirmed to have high capabilities in activating enzymes involved with the metabolism of drugs as well as drug intake/emission, and have properties that are close to the intestinal epithelial cells of the small intestine that play an important role in drug absorption. These research results are ground-breaking in the field of drug discovery support using human iPS cells, and are expected to contribute significantly to enhancing the efficiency of the development of oral drugs. Currently, in new drug development, animal experiments are conducted to confirm the efficacy and safety of drug- candidates, followed by clinical studies on humans subjects. However, as the properties of animal and human cells are different, in many cases, even if efficacy and safety are confirmed in animal tests, they are not confirmed in humans, and development is discontinued. For this reason, there is an increased need to confirm efficacy and safety using cells with properties equivalent to those of primary cells prior to conducting clinical studies. In the case of oral drugs, widely used among pharmaceutical products, the intestinal epithelial cells of the small intestine are mainly responsible for intake of the active pharmaceutical ingredient, a portion of which is metabolized by enzymes within the intestinal epithelial cells, and a portion of which is emitted outside the cell. Since the drugs and the metabolites that remain without being emitted are absorbed within the blood and circulate throughout the entire body, the assessment of the absorption and metabolism of drugs by the intestinal epithelial cells is one of the important endpoints for predicting efficacy and safety in accordance with the dosage. It is extremely difficult, however, to stably acquire primary enterocytes for use in drug discovery research. Currently Caco-2 cells derived from human colon cancer cells are generally used, but with these cells there was the issue that activation of drug metabolizing enzymes was low. Fujifilm and Nagoya City University investigated the activation of CYP3A4, a representative drug-metabolizing enzyme in intestinal epithelial cells, in these cells and the gene expression levels related to transporters that govern the intake of drugs into the cells and emission of drugs outside the cells, with the following results. Upon assessing CYP3A4 activation, it was found to be approximately 10 times that of Caco-2 cells and equivalent to that of primary enterocytes (Figure 1). 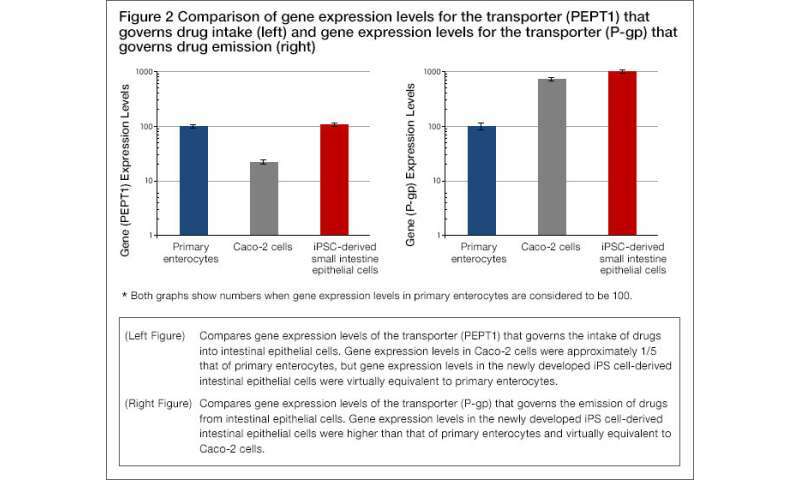 Upon comparing the expression levels of transporter genes that govern the intake of drugs into the intestinal epithelial cells and emission of drugs outside the cells, the transporter (PEPT1) that governs intake was found to be greater than for Caco-2 cells and virtually equivalent with primary enterocytes. The transporter (P-gp) that governs emission was found to be virtually equivalent with Caco-2 cells (Figure 2).